It’s a long story, but let’s just say the whole Christmas tree-getting and -decorating experience did not go as planned this year. 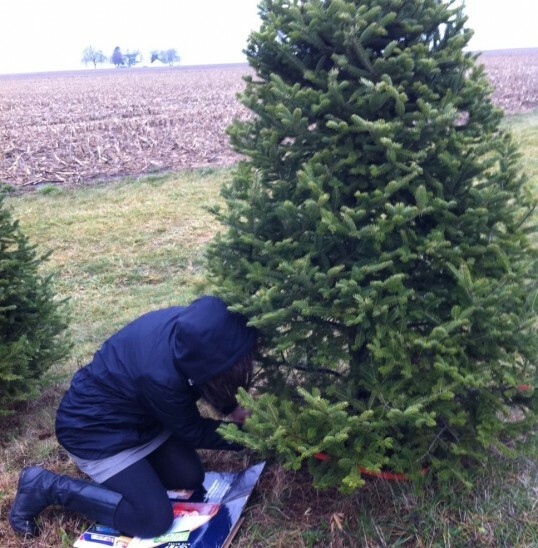 Trust me, I had a plan—one that involved lots of idyllic family time and a tree that was up on Saturday and decorated on Sunday (if only I could orchestrate the season’s first snowfall, too…). But the above-pictured tree arrived home Sunday at dusk, and still sits in our living room decoration-free. If you want to know the truth, it’s kind of pretty that way. Maybe we’ve started a new tradition that involves staging out the whole Christmas tree procurement process. Anyway, I’m sure we’ll find some time this weekend to all be together for an hour or so, to drink hot chocolate and get the decorations up. It will all work out. It might not sound like it to you, but trust me when I tell you this: I’ve come a long way in my ability to go with the flow. Going with the flow is one of the skills that I most want my children to learn, probably because I’ve seen the toll the opposite approach has taken on me over the years. Of course teaching this sort of thing is all about modeling it, not talking about it. My first-born, Q, is a natural at going with the flow, but my baby, S, is way off on the other end of the spectrum. The unexpected detours and game-plan changes sort of make her world fall apart. Usually, I fall somewhere in between, but on Saturday evening, as I sat grumpily knitting in my tree-less living room while Jason slept off some evil illness, I was inwardly bemoaning the unraveling of our entire holiday season. Nothing would be right! Luckily, I gave myself an attitude adjustment on Sunday, but let’s face it—during the holidays, it’s easier than ever to be plagued by our expectations, traditions, and vision of how things “should be.” This Advent, though, I’m slowly beginning to see that it’s more important than ever to let go. (Now that I think of it, there’s a connection to what I wrote about here—Advent as a “both-and” season.) The very traditions that we put in place to make the season meaningful and rich can end up being roadblocks—especially if everything doesn’t go exactly as planned. And it won’t, right? In my case, the holidays “not going as planned” became the new normal when I got a divorce eight years ago and had to accept the fact that I would only get to spend Christmas eve and day with my daughters every other year. That sort of turned all the traditions and idyllic holiday images in their heads. But even without a divorce in the mix, things change. Our kids get older. Our siblings move away or get married. Heck, these days, with global warming, I can’t even rely on having a white Christmas when we’re in Michigan. Yes, there’s sadness and disappointment in all those changes, but there’s also a certain freedom in learning to let go—to go with the flow—at Christmas. It opens us up to new ways of seeing and understanding a season we know so well. It leaves room for surprise, stories, and bonding (Q and I bonded and had many laughs over our tree-cutting adventure). And most importantly, it’s intricately woven into the fabric of what this season is all about—Mary and Joseph going with the flow, setting aside the more conventional, ideal way they envisioned things and making themselves available to something unexpected and so much greater. It’s an attitude that doesn’t come naturally to me, and it hasn’t always been pretty watching it wrestle its way into my life, but I’m definitely moving toward that spirit of Christmas, and I know it’s a gift. I love this post, especially how you relate it with the experience of Mary and Joseph. “Making ourselves available to something unexpected and so much greater” – sounds like a rewarding way to spend the Christmas season. I’m having to embrace this “go with the flowedness” this season as well. It is the 1st time in 30 years that I won’t be celebrating with my “family”, and it is both sad and freeing. I’m hoping I can embrace that it” leaves room for surprise, stories, and bonding” more than the alternative. Thanks for sharing Kristin. Are you kneeling on a random piece of car garbage? Going with the flow is hard. I keep reminding myself of how the big pieces are all set and good, even if the little bits are muddy. I need to remind myself often–it doesn’t come naturally! I’m more prone to worry/calculate/problem solve. Years ago my missionary bus, halfway up a mountain in Peru, broke down. The drive examined the bus and proceeded to find a shady place to sit. “Aren’t you going to do anything,” I asked. It was a go-with-the-flow moment for me. We got over the mountain eventually, and discovered a place where time moves at a different pace. I could use more go-with-the-flowness, even today. MINORITY REPORT: Tradition exerts it’s weighty pressure and encourages us to “push through” because this is worth doing. Some pressure is good because some things are worth pushing for, and we need to be reminded. CONCLUSION: I still haven’t learned when to find a shady spot or when to push through. Lorna, I like to think that I’m just very loyal to tradition, but it’s probably even more true that I’m averse to change. It seems to be part of being human, doesn’t it? I hope the changes this Christmas come with many good things for you. Dorie, ha! No, thankfully the tree people had a stack of cardboard specifically for kneeling purposes—it had been a wet weekend and it was a muddy tree farm. I was so unprepared in part because my decision to “just do it” straight from church was spontaneous, and also because I didn’t realize all the trees at this place were cut-your-own. Anyway, thanks for reminding me that the big places are “all set and good.” So true. Ray, it is a true challenge to apply a Peruvian state of mind in a fast-paced American culture, isn’t it? I completely agree with this: “Some pressure is good because some things are worth pushing for, and we need to be reminded.” For me, I think the key is to push through with the larger goal, but “sit in the shade” regarding some of the specifics (like when we got the tree and who went along and when it gets decorated). Often, the larger goal is good, or at least it’s rooted in good, but my approach needs some tweaking. Such a good post, and such thoughtful comments. I am not always good at going with the flow – but oh my do I need the reminder that the big pieces are all good, and that the details will either work themselves out or just disappear. Ah, life. When will you ever go as expected or even as planned? What’s that now? You say never? Oh. Okay. And change? Change makes my whole body hurt. We are undergoing a year of change that makes me feel at once eager like an explorer and like the girl who just wants to stay home and gaze out the window. These are good thoughts. Good thoughts. I love this. You in your churchy clothes sawing away! Something about the Christmas story is just like regular life. I don’t picture Mary and Joe reverently journeying to Bethlehem in some amazing spiritual quest, they were in a rush, it was a hassle, and traffic was murder…but somewhere in the middle of it all, the baby was born and they slowed down, and worshiped alongside the shepherds as the *magic* happened. This is such a lovely post with such a good, grounding reminder, I kinda hate to give you your TOL’s 12 Gifts of Christmas gift here. But I promised. Like you, a normal Christmas went the way of the dodo for my brother and I when our parents divorced. Our dad became like the Army reserves–without the monthly weekends. We saw him for a week, or two, twice a year–summer, and Christmas. There wasn’t much relationship in the in-between times. Sounds like you’re doing much better in that regard. I share all this to say that I can identify with going with the flow. My whole life has been that way–continuously adjusting, and the concept of a life plan is entirely foreign to me. I know how to get by. If I learned anything from my folks’ divorce, it’s how to survive. Great post. It’s definitely an important attitude to have this time of year since we always seem to try to squeeze so much into the season.